More than 30% of prescription painkiller deaths involve methadone, even though only 2% of painkiller prescriptions are for it, the government reported. The Centers for Disease Control and Prevention reported in its July 3 MMWR that there was a six-fold increase in fatal methadone overdoses 1999 to 2010, and rates of overdose death for methadone compared with rates for other major opioids in 13 states for 2009. 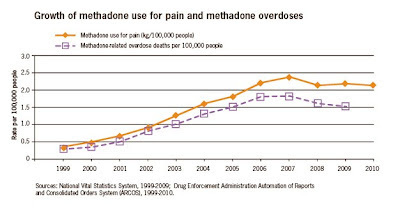 Methadone overdose deaths and sales rates in the United States peaked in 2007. In 2010, methadone accounted for between 4.5% and 18.5% of the opioids distributed by state. Methadone was involved in 31.4% of opioid-related deaths in the 13 states. It accounted for 39.8% of single-drug opioid-related deaths. 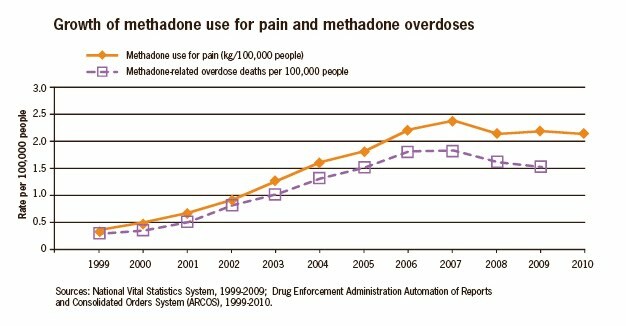 The overdose death rate for methadone was significantly greater than that for other multidrug and single-drug deaths. Health-care providers who choose to prescribe methadone should have substantial experience with its use and follow consensus guidelines for appropriate opioid prescribing, the CDC stated. Providers should use methadone as an analgesic only for conditions where benefit outweighs risk to patients and society. Methadone and other extended-release opioids should not be used for mild pain, acute pain, "breakthrough" pain, or on an as-needed basis. For chronic noncancer pain, methadone should not be considered a drug of first choice by prescribers or insurers. --screening and monitoring for substance abuse and mental health problems. --prescribing only the quantity needed based on the expected length of pain. --using prescription drug monitoring programs to identify patients who are misusing or abusing methadone or other prescription painkillers. --monitoring patients on high doses of methadone for heart rhythm problems. --educating patients on how to safely use, store, and dispose of methadone and how to prevent and recognize overdoses. More practical tips on managing opioid-related care is available through ACP Internist.